The Jets were an unrecorded group formed of high school kids; George Baker,John Roney,Sam Wellington,Jam Housley,Ralph Goble and Mike Reale on stan-up bass( pictured performing on a Steubenville, Ohio TV Teen Dance Show - 1955) originally from the Steubenville/Toronto area of Ohio enjoyed singing doo-wop and a cappella named themselves The Jets in the mid 50’s. 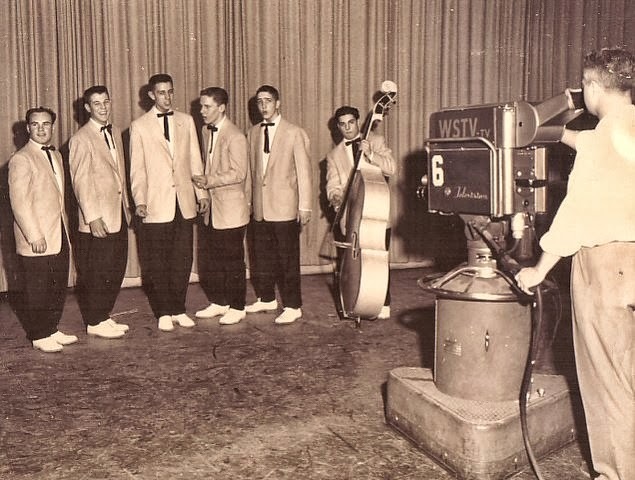 They enjoyed rehearsing in the men’s room of the Ft. Steuben Hotel due to the acoustic reverberation, After winning a Tri-State area talent contest the group disbanded as they moved from high school to college and military service. After two stints in the US Navy, Sam formed a new group calling themselves The Four Guys. From the 1960's onwards The Four Guys were a popular harmony singing group who drew book coverappeal with a unique sound by blending easy country, western and pop music that drew much broader audiences.